When the option Blank the host's screen is enabled, i assume the host will just have a blank screen. ive had the user at this host reboot there PC (while i am working on it) as they think its crashed. Can we have a way to put a customization message on the that screen (and a way of putting some LOGO as well to brand the support).? Also it would be nice to have a status in the viewer somewhere that confirms the users screen IS BLANK, sometimes ive been told all the sensitive work i was doing everyone could see, when i thought it was being blanked when it wasnt. Understood. Give me some time, I'll discuss this with our developers to see if anything can be done about it. Including a LOGO and text (and you can see the PC name as well so if anyone calls they can tell you which PC as support happens on more than one at a time generally). Possible fillable fields in the text could be an idea like the below, that would be used to "fill in" things like the computer name.. There is one problem. The new blank screen mechanism turns off the monitor itself. 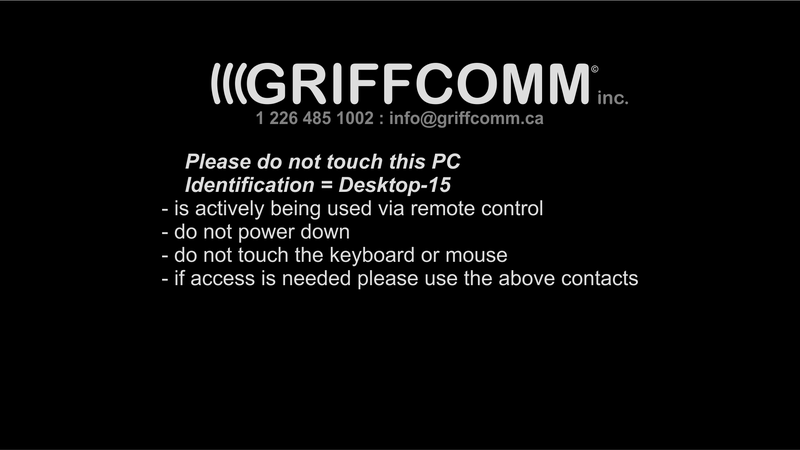 Can you add in another system of putting up a message, as a turned off screen results in the user moving the mouse around and then hard resetting the desk as it (correctly) looks like it crashed. Unfortunately, not when the Host is on Windows 8/10. There's simply a different way the blank screen works on those systems. As for Windows 7 and earlier, we'll see - perhaps we'll leave this feature for compatibility and not remove altogether.